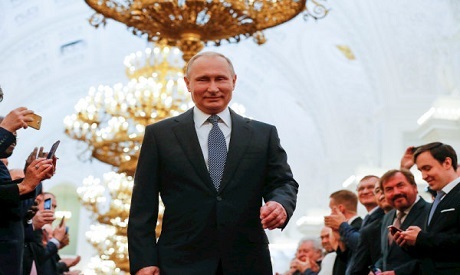 President Vladimir Putin stuck with his long-serving prime minister in his first act after being sworn in for a new term on Monday, signalling that he would keep faith with a policy direction that has brought Russia into conflict with the West. Putin secured a new six-year term after more than 70 percent of voters backed him in a March 18 presidential election. His most dangerous challenger, Alexei Navalny, was not allowed to take part and on Saturday was detained at a protest called under the slogan: "Putin is not our tsar." The choice is also likely to be parsed by Kremlin-watchers for any clues about what happens after Putin's current term ends in 2024. The constitution bars him from seeking a third consecutive term. Vitaly Mutko, who oversaw sport at a time when Russia was accused of a state-sponsored programme of doping, lost his sports brief, but kept his deputy prime minister's post and will oversee construction. "Taking up this post, I feel a colossal sense of responsibility," Putin told his audience of Russian officials and foreign dignitaries, among them former German chancellor Gerhard Schroeder. Foreign diplomats see little prospect that Russia's standoffs with the West that have dominated the past four years will ease during Putin's new term. Clashes in the past few weeks over US sanctions on Russia, the conflict in Syria, and the poisoning in England of former Russian spy Sergei Skripal have left some diplomats worried that the confrontation could spiral out of control. Russia's economy, the world's eleventh largest, returned to growth of 1.5 percent last year, helped by a recovery in oil prices. But that fell far short of the growth Russians grew accustomed to earlier in Putin's rule.